Diane Paul and I were talking about how you could maintain a Mediterranean diet during Passover. I asked her to share her perspective with all of you. The 8 day Jewish holiday of Passover starts at sundown on Monday March 25, 2013. The basic kosher laws apply year round--no mixing of milk and meat during a meal, no pork products or shellfish. 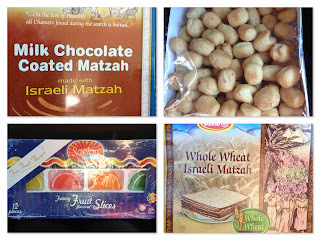 At Passover, additional restrictions apply--no leavened bread (to commemorate freedom from Egyptian slavery)--no foods made with grains (wheat, barley, rye, spelt, or oats). There are two main Jewish groups in the world, Ashkenazi and Sephardic. For Ashkenazi Jews, there are more forbidden foods during Passover--rice, millet, corn (including corn syrup), dried beans, lentils, peanuts, peas, soybeans, green beans, sesame and poppy seeds, and mustard. Sephardic Jews may eat these foods at Passover. foods is Mediterranean diet friendly? Kosher for Passover wine--if you graduated from Wave 1-sorry, no beer--it's made from grain. A similarity between the Mediterranean diet during Passover and at all other times--is that you'll have the same challenges. Passover recipes abound using potatoes, sugar, and matzah and are hard to resist. Like most religious and secular holidays, sweets are abundant. What would Passover be without some of the creative matzah recipes like one of my favorites: caramel, pecan, chocolate-covered matzah--not very Mediterranean though. Imagine Easter without peeps--that's Passover without potato and sweet matzah kugel (like a casserole), carrot tsimmis (carrots are not on the Wave 1 list), chocolate-covered marshmallow sticks, jelly rings, or chewy chocolate almond chews. Here's a Passover recipe to adapt for the Mediterranean diet. My Dad always made fried matzah for us (called matzah brei)--now I'll make it for him and the rest of our family using whole wheat matzah and olive oil. I'll be having a Mediterranean Passover--but there's no way I'm missing some of those special Passover treats. So lift your glass of Kosher for Passover wine and say--To Life! (L'Chaim) and pass the veggies.